The unbelievable pitching of Cliff Lee has revealed itself in June and it’s not showing any signs of going away any time soon. Lee pitched his second straight complete game shut out as the Phils beat St. Louis 4-1 and evened the season series up at two games apiece with the final match up tomorrow. For the second straight time, Lee didn’t have to strike out a high number to be dominant. Getting batters to make poor swings, Lee allowed only six hits and one walk while striking out three on a season-high 126 pitches. Lee got all the offense he needed in the 4th inning. Jimmy Rollins hit a solo home run off Cardinals start Kyle Lohse. A couple batters later, Ryan Howard hit a two-run shot to make it a 3-0 game. Lee cruised after that as the Cardinals managed to go 1-for-5 with runners in scoring position and failed to score. The Phils tacked on one more run in the 9th. Shane Victorino hit his eighth triple of the season and Chase Ultey drove him in on a sacrifice fly. Lohse pitched well despite the two long balls. He went eight innings, allowing three runs on seven hits and no walks. But Lohse’s downfall was he failed to strike any Phils out. In fact, the only Phillie to strike out was Howard in the top of the 9th to reliever Mitchell Boggs. 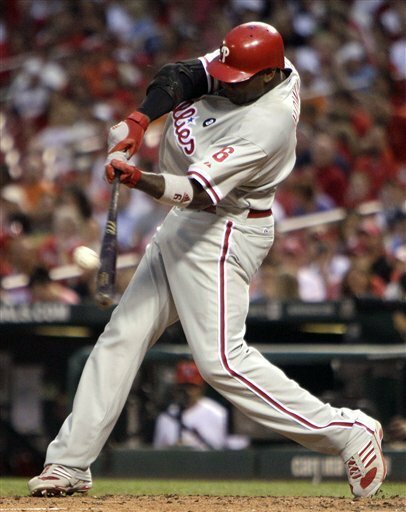 Rollins and Howard both had two-hit games for the Phils. Lance Berkman had two hits for St. Louis as well, including an 8th inning double. For Lee, he hasn’t allowed a run in his last 23 innings. And in his last four starts, he’s allowed only one run in 33 innings pitched (0.27 ERA). The Phils have Roy Oswalt on the mound to face perennial foe Chris Carpenter of the Cardinals. 3B: Victorino (8). HR: Rollins (7). Howard (16). WP: Lee (8-5). LP: Lohse (7-4).